After having their initial launch run into some red tape troubles, New Leaf is back, offering some sorely needed competition in the Canadian market. From Hamilton, they are offering some great prices to Nova Scotia, New Brunwsick, Manitoba, and Saskatchewan. To Alberta and BC, the prices are less exciting. The last time New Leaf launched, WestJet and Air Canada responded by dropping their prices. That's what competition does. Keep an eye on YYZ Deals for word of them doing so again! 2. Search for a flight from Hamilton (YHM) to one of the cities listed above. Start with a date that is July 25 or later. Moncton, New Brunswick for $186 CAD roundtrip including taxes (or $176 CAD if you use the Flight Network promo code below). Try Mon/Fri dates in late July, August, September, and October 2016. Winnipeg, Manitoba for $202 CAD roundtrip including taxes (or $192 CAD if you use the Flight Network promo code below). Try Mon/Fri/Sun to Mon/Fri/Sun dates in September, and October 2016. Saskatoon, Saskatchewan for $244 CAD roundtrip including taxes (or $235 CAD if you use the Flight Network promo code below). Try Wed/Sat to Wed/Sat dates in very late July, August, September, and October 2016. Halifax, Nova Scotia for $195 CAD roundtrip including taxes (or $185 CAD if you use the Flight Network promo code below). Try Thu/Sun to Thu/Sun dates in September and October 2016. The flight will initially show up as $190 but jump to $201 when you verify it. 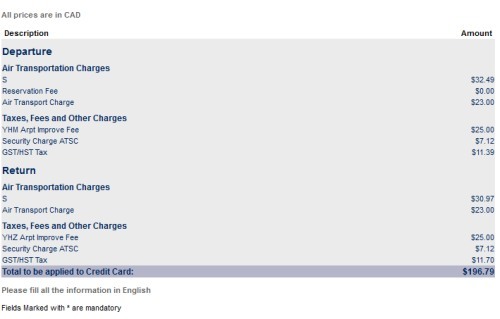 This should bring down the price to $151 CAD roundtrip including taxes. New Leaf is offering a promo code for 50% off the base fare on flights between July 25 and July 31 (their first week of operation). WestJet has dropped the price of their September flights from Toronto to Moncton, New Brunswick down to $186 CAD roundtrip including taxes. Click on the departure date box to open up the calendar and look for the $187 roundtrip date combinations in September 2016. UPDATE 8/27- October flights from Hamilton to Halifax, Nova Scotia are available for $197 CAD roundtrip including taxes, including dates over Thanksgiving. 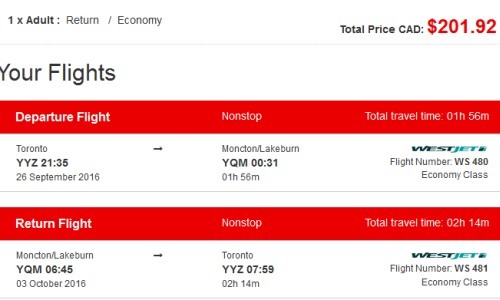 The same dates from Toronto are $419 CAD roundtrip. 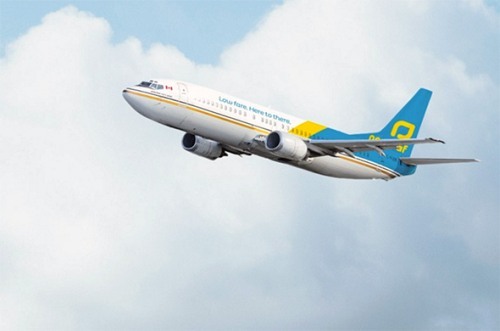 westjet, flight deals, british columbia, canada, bc, north america, alberta, hamilton, yhm, kelowna, ylw, halifax, nova scotia, yhz, winnipeg, manitoba, ywg, saskatchewan, saskatoon, yxe, new leaf, moncton, new brunswick, yqm, edmonton and yeg. 9 Responses to "New Leaf Take 2 - Hamilton to Nova Scotia, New Brunswick, Manitoba, Saskatchewan - $198 to $245 CAD roundtrip incl taxes"
Thanks! Booked Hamilton to Mocton in September. Whoops, sorry, added it to the post! Just a heads up that the promo code only takes $10 off the entire bill not $10 per ticket. Thanks though I appreciate all your hard work. Is there another promo code that makes the price drop to $204? Whenever I search for a flight to Winnipeg It still says $438. This was posted back on June 23. Prices have likely changed. Yeah I checked since June and the prices were still higher than $202.